Surfing is fun, and exciting. Many people love to surf, but cold water surfing? Not an idea most would be excited about. The sub zero temperatures below the water is something that Chris Burkard found passion in as he nearly “froze to death” taking pictures in some of the most remote places on Earth. And that joy is something rare, he says. In his mind, people do not always have a passion for something, they have nothing that truly excites them. He says that everyone should have something that they love no matter what. I couldn’t agree more, and I found that personally in soccer. 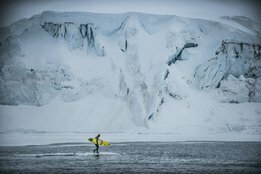 Chris loves cold water surfing in the Arctic Circle and no matter what anyone says, they cannot change that love. In this very short ten minute talk, he gets his point across perfectly. He loves to find remote places located away from the tourists crowding the beaches in bathing suits. He loves the rush when he dips below the surface in the icy waters. He found those rare things that made him slowly gain passion for the icy waves. Chris knows that everyone should have their equivalent of dipping below the surface and the rush of blood it carries with it. The point he leaves us with is that you need to go and seek out that opportunity as it may not present itself to you in plain sight. Do a little searching. He made me reflect on my life and what I have passion for. That’s why my final talk is on what else other than soccer, because I love it. In the short video he begs me to ask you the question, what are you waiting for? Find what you love and let no one stand in the way. A native Australian, Hamish grew up around the ocean as a child, just like many other people do worldwide. Extremely popular around the ocean, surfing is a sport that can be enjoyed by all within range of the beach because of its low amount of equipment, and cost. However recently there has been a large increase in the number of shark attacks, and an even more alarming is that more and more of the attacks turn out to be fatal. Upon discovering this news, Jolly finally put his long time static plan in motion. His whole principle, is backed by science. He met the predecessor to the late Steve Irwin, Timothy Treadwell and learned about shark’s vision. He learned that they see in grey scale, or black and white. He thought of possible applications with the new information for his idea, but never began work until a few more fatal shark attacks happened that same year. Since then, the launch of their product is eminent. The product, is a normal wetsuit that most surfers wear, however the only difference is the pattern used. Rather than using the traditional black, they used black and white stripes similar to that found on coral snakes. This specific pattern aids the snake in unconventional camouflage methods to protect it from the shark, so theoretically it should do the same for humans. After all, the pattern had been used with ancient indigenous peoples for a long time to deter the shark gods, yet no one thought to use the pattern for real world applications. What the pattern does, is make the shark less violent. In effect, it makes the sharks confused to the point where they investigate the object within the pattern, but won’t attack it. They also made a pattern using different shades of blue, which mimics the wavelength in the water that makes the surfers nearly invisible rather than having a “drug” effect on the shark. This all means that the sharks cannot even find the object they are looking for, even when they can smell and feel the electricity taken in by their special senses. Through tests with bait buckets wrapped in the respective patterns, the scientific evidence supports the claims originally drafted by the scientists and Jolly. The sharks either investigated but did not attack, or looked aimlessly for the bait bucket only feet away from them. With the control group, the black wetsuits, the shark attacked the bait almost instantly. For Jolly and his crew, as well as surfers and divers, it is particularly exciting because it shows and proves that the technology is real and serves a purpose to help people. The goal of Jolly, looks likely to be completed as he does his part to save lives. In his eyes, it is a win-win. The sharks are not harmed and humans are not either. For me personally, I love to see something backed by science have a real application to help everyday people keep their limbs, and lives. To often animals are hurt when there is a common fear of them, and we don’t do anything to try and understand them. I see humans but no humanity in some ways we deal with matters like this. It represents a big step that humans should continue to take in the development of things to better our lives and those who share our home with us. As someone who surfs myself, I can see the use for me to feel safer. Are athletes really getting faster,better,stronger? David Epstein answers the question many athletes were wondering since the recent trend of world records being broken every year. Dig a little deeper and you’ll find that the athletes of today are not really any faster or stronger than those that were the best of the best 50 years ago. The gist of it all, is technology. In 1972, in one hour a man cycled just over 30 miles. Of course it was the world record at the time. In 1996, a new world record was set. The cyclist, travelled just over 35 miles in the same one hour however this was not due to training. The new record was set due to new bicycles and new suits to wear, which allowed for a sizeable 5 mile jump. However the cycling federation was the first to declare that the record would not stand unless the cyclist did the same challenge in the same exact gear as the original world record holder. Under the same circumstances, the new record was set by an improvement of only a few hundred feet. Marginal, but a record none the less. And in track, Jesse Owens, gold medalist and World Record setter of the 1934 Olympics would come 2nd only to Usain Bolt if they raced on the same surface, in the game gear this day in age. The distance Owens would have lost by, would have been 4 feet. In a sprinters world, that is nothing. This is another prime example showing the impacts technology has on records and the perception they can have on the general populous. In some cases, athletes are hyped up through social media and then they disappoint. However in certain cases, the training does make a difference and the athlete is the deciding factor as tactics rather than technology evolve. It is not alright and we can’t blame technology though. We do this all the time, with what we think is better on its own is really only as good as the piece of work making things easier for you. A shortcut, in some minds. This is why some people, do things the old fashioned way. This “original” way is done with things from churning butter to making houses. All in all, if you really want to break records and be better than the previous generation at whatever it may be you are trying to do, be original and rely on technology to create a big cap in what we think is “better”. How to run a company with (almost) no rules. Much of our years as children and teenagers are spent doing nothing but school related activities. We wake up at 6, leave school at 2, and work for an additional 3 hours at home. All in all, I spend 12 hours, half the day, doing activities related to school. Not fun. When we graduate and go to college, we do the same and finally when we graduate college, we do the same thing with our everyday jobs. The idea for Ricardo Semlers Company was to give people time to get away from their work during the weeks, so that people did not feel wholly consumed by their jobs. So they took away the “boarding school aspect” of the company. No dress code, no set times you had to arrive and leave the offices. The principle idea was to give the employees the power. Much to Semlers surprise, the average age of people interested in his company were not older people, but rather younger people with an average age of just 29. The workers wanted to have control and time on their “terminal days” to do whatever they pleased, and to not be worried about going into work the next day at 7 am. Likewise, the bosses didn’t want to know where the employees were, as long as the work got done. When the work was done, they were rewarded. “If we set them a goal to sell 57 widgets in the week, and they sold them by Wednesday, we tell them to go to the beach.” The principle is that with less rules and more rewards, the work would get done much more effectively. The theory, worked better than anyone had thought it would. Another principle was that they listened to people and regular employees and let them influence and vote on decisions with high level board members. “It kept us honest.” Said Semler. Then a real thought occurred to Ricardo. What if they took this new idea, which was working so great in their own company, and made a school with more or less the same ideas. The end goal, was to engineer a new type of school that taught wisdom rather than grades, and to change the way we use education. After all, what is more important? Actually learning, or getting a good grade? It made me think, too. It is the same format as the very project we are working on with my English teacher, Mr. Shreffler. We are focusing more on learning and being excited to gain more knowledge then we are on taking tests on short reads that do not pertain to real world knowledge at all. Then I wondered, if different people around the world are innovating the way school works, and so many people have figured much more efficient ways of working the norms with so many people willing to get on board with the new but proven model, why do we still use the same system? Just as with everything else we deal with, why do we get sucked into a pattern that doesn’t change while the world we know is constantly changing? As I always think about it in football (soccer) terms, you learn very quickly that in the game if you fail to adapt with what is happening around you, you get burned. Badly. The same can be said with the way we run most companies and schools, and in my eyes, we are just waiting to be burned. My name is Greyson Everidge, and I am a ninth grader at West Orange High school. My class is taking part in the West Orange Tedx Talks. Our project is to explain and help teach others without the stress of grades, through the use of Ted Talks. The end goal, is to give our own Tedx talk on the topic "What matters (to me)?" My interests for the project are about business and money, how the market moves. Although I am not sure of my end goal, I do have a vague idea of what that could be. I do however want to learn more about the processes of money and its effects on everyday people.